Accentuate Your Beauty! Breasts are a Fortune! Fed up with Undersized Breasts? Had Enough of that Desperate Mirror Image Anytime You Get Dressed-up? You are one of millions of women who desperately pursue a way or another to Enjoy a Better Image and a Sexier Body. An undersized-breasts woman keeps feeling anxious and uncomfortable anytime she gets undressed by her partner. Adding to that, she loses self esteem and confidence and this brings even more stress into the couple. So when it’s a matter of pleasing a partner, along with self well-being, we are more than concerned. BreastNat™ remains doctors’ best breast enhancer is the authentic ingredients its formula encloses and the extreme care health experts adopt during the selection of every single ingredient. In fact, what these natural ingredients do is just stimulate your body to produce more estrogen, just the way it does during puberty. This process of breast cells and tissues naturally stops after puberty, and the phytoestrogens enclosed in BreastNat™ naturally reactivate the same process at any stage of your life. When your body produces or is stimulated to produce more estrogen, your breasts keep growing bigger and firmer, allowing you to reach the size you always dreamt of naturally without any implants or external constituent. Its Formula Will Offer You A Unique Well-Being! The natural formula of BreastNat™ contains unique supplements that are rich sources of phytoestrogens, and your body responds to those ingredients perfectly, which ensures a smooth and healthy breast enlargement without any risk of side effects or breast tissues damage. Adding to that, doctors assert that the natural ingredients enclosed in this unique formula, nourish only breast tissues, and no other body parts would be enlarged but your breasts. Every bottle of BreastNat™ contains 60 capsules. 1 capsule twice a day with a glass of water will help you get perfect results, and you will start noticing your breasts getting bigger and firmer starting from the first week. 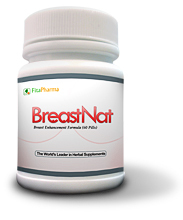 Thanks to its herbal formula, BreastNat™ grants a quick and safe enhancement of your breasts size naturally and without any side effects.